Have you made any soup lately? 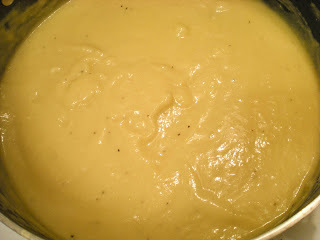 Ever since I made the creamy broccoli soup without cream, I fell in love with the recipe and test on other vegetables. 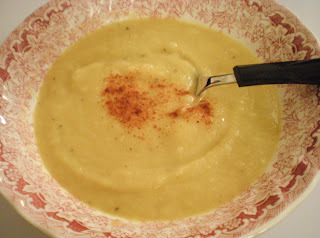 I'm amazed how one potato can convert any vegetable into a creamy soup, even on sweet potatoes and Brussels sprouts. These soups are simple to make, all you need is to cook everything in one pot and purée it in an immersion blender. Especially during these cold winter times, you do need a nice and warming soup. 1. In a large pot, melt butter over medium heat. Sauté onion until translucent, about 5 mins. Add in garlic and cook for 1 min until fragrant. 2. 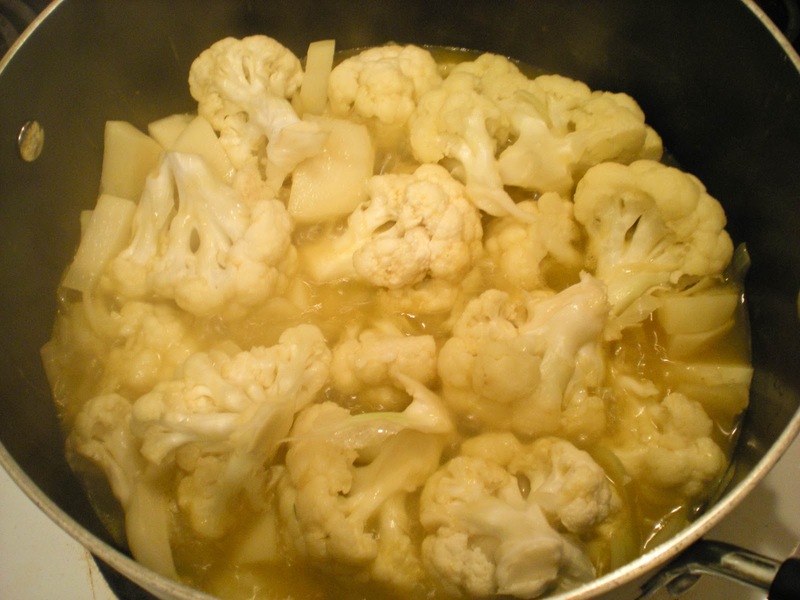 Pour in vegetable stock, cauliflower and potatoes, bring to a boil. Cover and simmer for 20 mins or until cauliflower and potatoes are tender. 3. Purée mixture with an immersion blender. Season with salt and pepper to taste. Serve and garnish with paprika. Thanks for visiting my blog. You have a very interesting collection of recipes. No cream creamy soups are great. I also use rolled oats, milk, yogurt, polenta etc to create no cream cream:) Its guilt free! Victor, believe it or not, I have never made a cauliflower soup before. This looks so creamy and comforting! I must give it a try! Love no cream cream soup and your looks so good and creamt. Thank you for your visit. It is great when you can make a soup (or any recipe) look and taste the same without having to add the extra calories. This looks wonderful. Immersion blenders are the trick! They can make anything a creamy soup. I love them and they're so easy. No extra dishes. this recipe looks wonderful and your picture is fabulous. thanks for sharing. cheers. i have never cook a cauliflower soup before! this looks great Victor thanks for sharing! Delicious and prefect soup for this chilled weather.. Your soup looks great! Never had cauliflower pureed into soup before. Thank you for sharing! I love warm hearty soups and this one looks great! I'm not the biggest fan of cauliflower on its own but might give this one a go. I don't know too much about pickled soup. I know there is a polish soup which uses dill pickles. Creamy cauliflower soups sounds delicious. I need to try this one. A lovely bowl of soup like this is so warming and nurtureing. This looks so creamy and nourishing, Victor. Your bowl is so pretty. I'm surprised that there is no cream in this soup and yet it look so creamy! Got to bookmark this recipe. Thanks for sharing. A lovely soup! Very comforting and delicious. Perfect when one wants to eat lightly. Yes! I made a soup last night but it was chucky soup :D I'm not a big fan of creamy soup but this recipe doesn't have heavy cream which sounds interesting. It looks healthy and I'm sure the hubs would love this! Thanks for the recipe! Your soup looks so warming and delicious. I made soup last night and also had it for lunch, yum. I usually use whole fat milk for creamy soups instead of cream. Next time I'll try just the potato like your recipe. Oh! 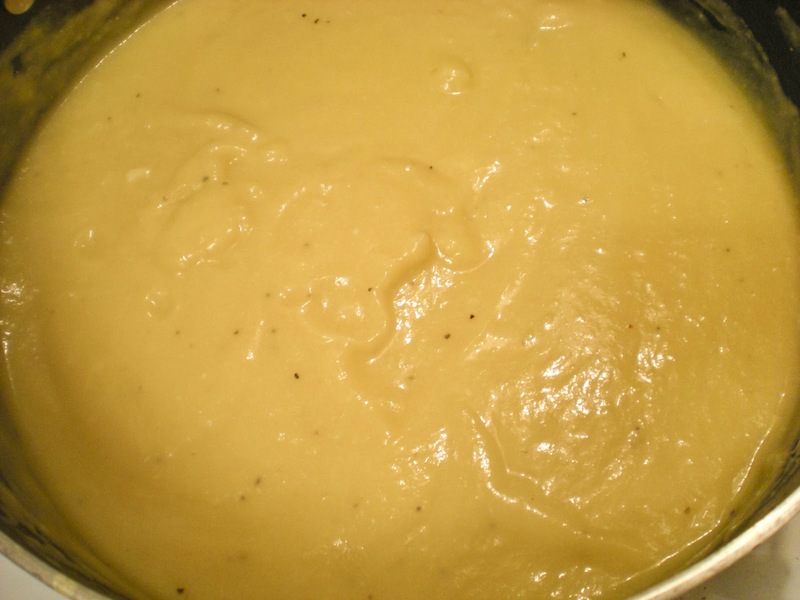 This cauliflower soup looks delicious, and SO SO healthy :-) Perfect for the cold weather. I do want one of those immersion blenders! Yet another reason I must have one. I adored your guest post on Chow and Chatter. I am so happy to have found your excellent blog! Thanks Rebecca for posting my guest post. I really enjoy writing.